The information provided here was written by the Fluid Sealing Association and is provided for your convenience. Please see the Author Bio at the end of this page. While nonmetallic flanges such as glass and reinforced plastic are used for some services, most flanges are metal. Metallic flange surfaces can range from a rough casting to the smoothness produced by lapping. A critical and fundamental aspect of sealing is the level of friction between the flange and gasket surfaces. The roughness of the flange faces can have a dramatic effect on gasket creep relaxation, blow out resistance and bolted joint tightness. 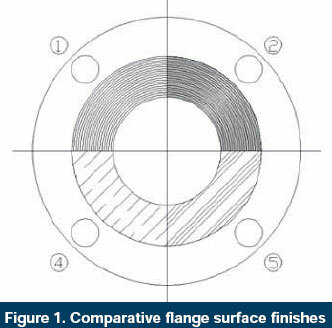 Depending on the type of gasket used in the connection, different flange surface finishes should be utilized to optimize gasket performance. The ANSI accredited ASME Standard B 16.5 requires that the flange face have a specified roughness to ensure the compatibility of the surface with the gasket and a high quality seal. This Sealing Sense is intended to be consistent with this standard. As a general rule, metal gaskets and those with less conformable metallic contact surfaces require a very smooth surface finish. Given the creep resistance and structural stability of most metal gaskets, the two mating surfaces can create a very tight, reliable seal. Alignment, parallelism and flange finish must be within specified limits to achieve an optimal result. Metal gaskets such as solid metal and corrugated designs offer very little forgiveness to flange finish or bolting and assembly deficiencies. A typical flange surface finish recommendation for these types of metal-contact gaskets is 64-μin Arithmetic Average Roughness Height (AARH)/Root Mean Square (RMS) or smoother. Soft gaskets-such as compressed fiber sheet and rubber that are more compressible-can be more forgiving to misalignment and out-of-parallelism of the flange. However, these materials are more susceptible to creep relaxation and movement while under a load. The flange surface finish can play a critical role in the gasket's service life and long term reliability. A smooth surface finish will not create the necessary friction between these mating surfaces, making a nonmetallic gasket more susceptible to creep under load. This creep can translate to a loss in bolted joint tightness and potential leakage. A rougher surface finish is generally recommended for soft, non-metal reinforced materials to create the necessary friction for stability and tightness between the mating surfaces. A typical surface finish recommendation for these materials is 125- to 250-μin or rougher. These gaskets are made by combining soft nonmetallic materials as fillers, facings or insertions with a metallic core or cover. These combinations include spiral wound, corrugated and jacketed designs. The combination of the tougher, more creep resistant metal with a more conformable facing or filler-such as PTFE and flexible graphite provides serious advantages, particularly in more severe services. For those with facing and spiral wound gaskets, a wider range of surface finishes can be tolerated such as 125- to 250-μin. For metal jacketed gaskets with soft filler, 64- to 125-μin is generally preferred. Raised and flat flange facings are machined with grooves, which may be either phonographic or concentric. The facing finish is judged by visual or tactile comparison with Roughness Average (Ra) Standards. Ra, stated in microinches (µin) or micrometers (µm), is shown as an AARH or RMS. While AARH and RMS are different methods of calculation, they giving comparable results and are often used interchangeably. The more common finishes are represented in Figure 1. Normally the manufacturer furnishes the "Stock Finish" unless the purchaser specifies otherwise. Stock Finish : This is a continuous spiral or phonographic groove. Suitable for practically all general service conditions, it is the most widely used of any flange surface finish. The AARH/RMS finish typically ranges from 125- to 250-μin. This finish is suitable for gaskets that have a soft conformable face. Under compression, the soft face will embed into this finish, which helps create a seal, and a high level of friction is generated between the mating surfaces. The finish for these flanges is generated by a 1/16-in or larger radius round nosed tool. Spiral Serrated : This is also a continuous or phonographic spiral groove, but it differs from the stock finish in that the groove typically is generated using a 90-deg tool which creates a "V" geometry with 45-deg angled serration. Concentric Serrated (Not depicted): As the name suggests, this finish is comprised of concentric grooves. A 90-deg tool is used and the serrations are spaced evenly across the face. This custom finish must be specified. Smooth Finish : This finish shows no visually apparent tool markings. These finishes are typically utilized for gaskets with metal facings such as double jacketed, flat steel and corrugated metal. The smooth surfaces mate to create a seal and depend on the flatness of the opposing faces to effect a seal. AARH/RMS finishes are typically smoother than 64-μin. Lapped Finish (Cold Water Finish) : Produced using a wide tool at high speeds, this finish is equivalent to a ground surface. It is mirror-like in appearance. Surfaces such as this are typically intended to be used without a gasket. Flange surface finish is a critical aspect of gasket performance. Metallic, semi-metallic and nonmetallic gasket materials interact with flange surfaces differently. Each of these gasket types require specific ranges of surface finish for optimum gasket performance with lowest leakage. Metallic gaskets require a smoother flange finish than either semi-metallic or nonmetallic. It is always best to consult with the gasket manufacturer to determine the best combination of flange surface finish, gasket design and gasket material(s). Fluid Sealing Association Sealing Sense is produced by the Fluid Sealing Association as part of our commitment to industry consensus technical education for pump users, contractors, distributors, OEMs, and reps. This month's Sealing Sense was prepared by FSA Member Charles Miskell. As a source of technical information on sealing systems and devices, and in cooperation with the European Sealing Association, the FSA also supports development of harmonized standards in all areas of fluid sealing technology. The education is provided in the public interest to enable a balanced assessment of the most effective solutions to pump technology issues on rational Total Life Cycle Cost (LCC) principles.